The logania family (Loganiaceae) contains about 30 genera and more than 500 species of herbs, shrubs and trees. Several genera yield valuable drugs and poisonous substances, and some are grown as ornamentals with showy clusters of flowers. 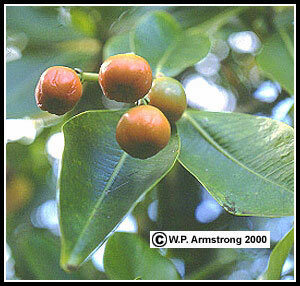 Species of Strychnos are native to South America, southeast Asia and Indonesia. The toxic alkaloid strychnine is obtained from seeds of the strychnine tree (Strychnos nux-vomica). Another species of Strychnos (S. toxifera) is one of the species containing a form of the alkaloid curarine which is used as an arrow poison. Strychnine has been used medicinally as a central nervous stimulant, but has been replaced by safer synthetic compounds. It induces muscle spasms and convulsions, and in some way magnifies sensations of light, smell, touch and hearing. In fact, any sudden stimulus, such as a loud noise, can trigger a seisure. Historically, strychine was used to treat a variety of ailments, but its medical use today is confined to neurological research. Strychnine is commonly used in rodent poisons, such as the small pellets placed in gopher tunnels. Note: Curare is also obtained from the bark and stems of Chondrodendron tomentosum (Menispermaceae). The latter species is the source of curare for the Botany 115 Plant Family Exam #4. 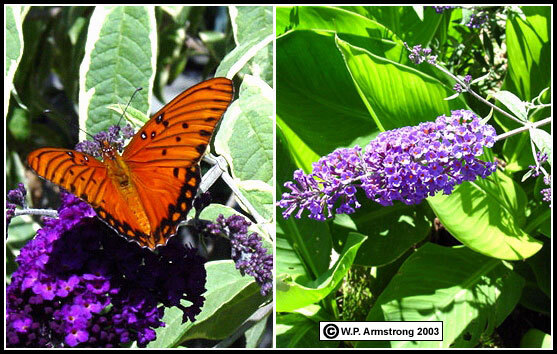 About 100 species of shrubs known as butterfly bush (Buddleia) grow in tropical regions of America, Africa and Asia. Some of these species have been used in their native habitats as fish poisons to facilitate the capture of fish. Several species of Buddleia are cultivated and grown as ornamentals in southern California. Their showy, fragrant flowers attract brightly-colored adult butterflies. Another member of the logania family that is commonly grown in southern California is the colorful vine called Carolina jessamine or false yellow jasmine (Gelsimium sempervirens). Native to the eastern United States, this vine is listed among the ten most poisonous plants native to North Carolina. Note: The yellow primrose jasmine (Jasminum mesnyi) belongs to the olive family (Oleaceae). Butterfy bush (Buddleia davidii) is commonly grown in southern California for its attractive clusters of fragrant flowers which attract various species of butterflies. Native to China, this cultivated ornamental has several named varieties. According to the Sunset Western Garden Book (1995), this species in not listed as poisonous. This photo shows a Gulf Fritillary (Agraulis vanillae) feeding on the the floral nectar. The caterpillars of this species feed exclusively on the leaves of nearby passionflower vines (Passiflora species), such as the blue-crown passionflower (P. caerulea). Fagraea berteroana (Loganiaceae) photographed on the Island of Kauai. Throughout their range, species of Passiflora have evolved an arsenal of cyanogenic glucosides to fend off ravenous insects, particularly the hungry larvae (caterpillars) of butterflies. When the larvae begin chewing on the vine's leaves, enzymes in the cells of the foliage break down the cyanogenic glucosides, releasing deadly cyanide. Cyanide, also known as hydrocyanic or prussic acid (HCN), is a universal poison that interferes with cellular respiration. The effects of hydrocyanic acid (cyanide) on the human body is disastrous because it inhibits the action of the vital enzyme cytochrome oxidase during cellular respiration. Without the oxidation of glucose, ATP production ceases. Therefore, HCN poisoning is essentially asphyxiation at the cellular level, because oxygen is not utilized at key steps in the Krebs (citric acid) cycle. The cells thus die from lack of oxygen even though oxygen is plentiful in the blood. According to Lawrence Gilbert, Helen Engler and Kevin Spencer (Nature, July 2000), butterflies of the genus Heliconius have evolved an ingenious mechanism to neutralize the deadly cyanides of Passiflora foliage, another remarkable example of coevolution between a plant and an insect. The larvae are able to metabolize the cyanogenic glucosides and, in at least one species, can actually utilize the metabolite as food. The adult butterflies have also developed the habit of feeding on pollen, thus prolonging their adult stage for months. Even more remarkable is their ability to convert the amino acids of the digested pollen into their own cyanide compound (cyanogen). Originally, the non-toxic adults may have only resembled poisonous butterflies, a phenomenon known as Batesian mimicry. After developing a mechanism to produce cyanogens from pollen, they made themselves poisonous to predators, a strategy known as Mullerian mimicry. Fuller, T. C. and E. McClintok. 1986. Poisonous Plants of California. University of California Press, Berkeley, CA. Levetin, E. and K. McMahon. 1996. Plants and Society. Wm. C. Brown Publishers, Dubuque, IA. Lewington, A. 1990. Plants for People. Oxford University Press, New York. Lewis, W.H. and M.P.F. Elvin-Lewis. 1977. Medical Botany: Plants Affecting Man's Health. John Wiley & Sons, New York. Schery, R.W. 1972. Plants For Man. Prentice-Hall, Inc., Englewood Cliffs, New Jersey. Sunset Books & Sunset Magazine (Editors). 1995. Sunset Western Garden Book. Sunset Publishing Corporation, Menlo Park, CA.